Tangy Yellow Curry Chicken on Jasmine Rice – see more of our recipes here. Blending Latin and Asian cuisines strikes just the right flavor balance, both chefs and diners agree. And while fusion cuisine sometimes gets a bad rap, the reality is that global mashups are hitting all the current trend notes with today’s diners –especially that most desired demographic, the Millennials. A recent blog post about a Technomics’ Generational Consumer Trend Report notes 45% of Millennials prefer to visit restaurants that offer bold and innovative flavors and ingredients, up from 37% in 2012. Consumers are also craving spicy and hot food: In its 2013 Four Takeaways for Fast Casuals, Technomic reports that the majority of consumers now find hot and spicy foods appealing. Not only do the Latin and Asian pantry embrace both these trends, the flavor profiles of these two regions complement each other. Both cuisines like to pack in the heat with chiles, and make good use of spices with intense flavors, such as coriander, cilantro, and tamarind. In a National Public Radio broadcast focused on the fusion of these two regional cuisines, Pati Jinich, host of the PBS show Pati’s Mexican Table, noted the strong influence of Chinese culture and cuisine in Mexico, dating back to 14th century Manila galleon trade and the immigration of Chinese to the region. In the modern world, chefs have taken to cultures with innovative menus that tap into consumers’ adventurous culinary spirit and cravings for bold flavors and authentic ingredients. 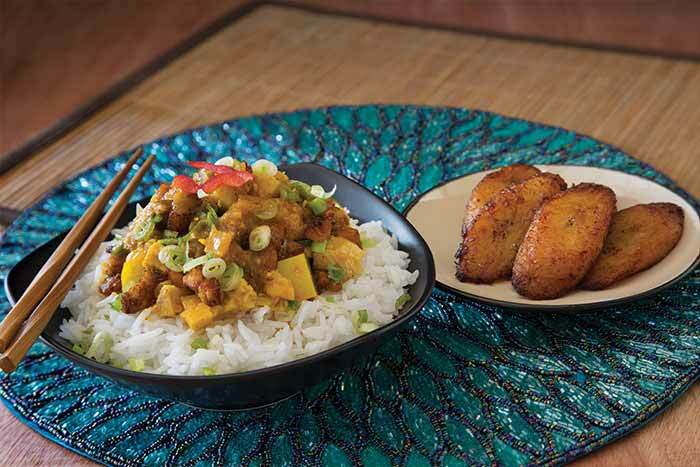 The Peruvian menu of China Chilcano, José Andrés’ ThinkFoodGroup latest Washington, D.C. concept, illustrates the region’s history as a melting pot of South American, Chinese, and Japanese cultures. Spotlighted by leading food pubs Nation Restaurant News and FSR Magazine, China Chilcano transforms traditional Latin and Asian fare to such offerings as Dancing Yucca, Nikkei-style crisp yucca fries with ají amarillo ‘aioli’, kabayaki, bonito flakes, and aonori seaweed and Langosta Kung Fu, 1-1/4 lb whole lobster, prepared with chicha de jora, smoked black pepper, ají amarillo, Asian vegetables, shiitake mushroom, and napa cabbage. In Flavor & the Menu’s latest issue, Maeve Webster of Datassentials cites El Rocoto, a Peruvian restaurant with two locations in California that incorporates Asian influences into its mint and ginger chimichurri. Speaking of California, Los Angeles has its own unique spot in the Latin-Asian food evolution. In the 1960s, sushi chef Ichiro Mashita introduced the avocado to the Japanese sushi roll, creating the ubiquitous California roll. Some 40 years later, Korean American chef Roy Choi rolled out the gourmet Korean taco truck, Kogi that we highlighted earlier this year, serving Korean barbecue tacos that blended Mexican and Korean cuisine. There is no question that this marriage of the Latin and Asian pantry is in it for the long haul, especially with endless pairing possibilities and regional tastes. Join the exotic and try something new. Check out one of our favorites: Asian Pork Tenderlion with Pure & Simple® Diced Yuca, Ponzu Mojo, Red Cabbage Slaw & Sesame Green Beans.